You have enough blogs, newspapers, radio and TV stations that will give you the history of Veterans Day. So, I’ll just tell you what it means to me. It has been my privilege to serve this great Country in the armed forces during time of conflict. My two older brothers served in the same era and my mother and father served during World War II. Even a younger brother has served in the Naval Reserves. I have one close friend’s name etched on Section 42E Line 003 of the National Vietnam War Memorial, which I have touched during my only trip to Washington D.C. I wear a daily reminder of his friendship. So, it should come as no surprise that Veterans Day is very special to me. While Memorial Day is a rememberance of our fallen, Veterans Day remembers the sacrifice of the living. In my time of war, veterans and active duty members of the Armed Forces were not particularly popular or welcome in some circles. I remember going home on leave after boot camp, proudly wearing my dress blues. No one sat next to me on the bus, no one would sit next to me at the bus stop lunch counters I was stared at and tolerated but rarely spoken to. It was the last time I wore my uniform off base. Years later President Ronald Reagan, while tearing down the Wall between East and West Berlin, managed to reignite patriotism among the people. It became fashionable to fly our flag everyday, not just on holidays. And he once again made me proud, through his speech and actions, to be a veteran. And I realized that it truly was a privilege to serve my Country. I have been a member of various posts of The American Legion, including our own Post 227, for more than 25 years. Six years ago, I helped found the American Legion Riders in California. 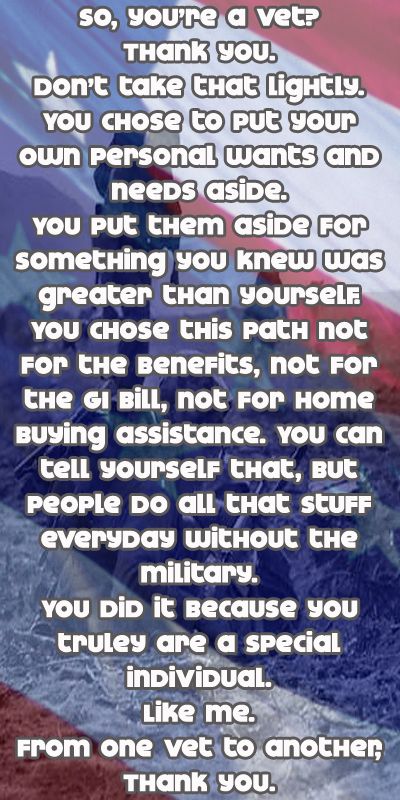 I surround myself with fellow veterans who think nothing of the fact they once wrote a blank check to the people of the United States of America, payable up to and including their life. It has made us members of a special brotherhood with, at times, a costly membership fee we have been honored to pay. Regardless of our stance on the war, the American People are immensely proud of our soldiers. We celebrate when they go off to war. We celebrate the the end of war and cheer the men and women serving there when they come home.. But, keep in mind that we had and continue to have, Armed Forces stationed around the world in the Korean DMZ, Japan, the Middle East and Europe, to name a few places. These warriors are the peacekeepers that insure yours and my freedom, from lonely outposts far from family and friends. Posted on November 11, 2011, in nonpolitical, orange county and tagged american legion riders, veterans day, vietnam. Bookmark the permalink. Comments Off on To Our Veterans.